It's been a painful start to the week for global markets as a wave of selling started in Asia and spread rapidly across the globe on what analysts have dubbed a "terrible trio" of crashing Chinese stocks, surging yields and fears about Italy's standoff with the EU. Beijing's 1% reserve cut announced on Sunday, which was meant to offset last week's global rate rout-driven weakness and push Chinese stocks higher, failed to avert a selloff in China after a weeklong holiday, as mainland stocks fell sharply with the Shanghai Composite plunging 3.7%, its biggest one-day drop since February, while the CSI300 index plunged more than 4% for only the second time in more than two and a half years. “China just cut reserve requirement ratios and expanded monetary policy, which is a response to the fact that China’s economy is slowing down but the market doesn’t believe there is enough stimulus to cut the slowdown,” said Guillermo Felices, a senior strategist at BNP Paribas Asset Management, calling the current concerns markets face a powerful cocktail. "They’ve injected more liquidity into the market to contain the slowdown, which has already translated into weaker equity prices." The Chinese slide comes after U.S. Treasury yields hit seven-year highs on Friday following strong data that signaled a continued tightening of the labor market and increased inflationary pressures, adding to the reasons for the U.S. Federal Reserve to continue with its hiking cycle. China's RRR cut was also seen as dovish, which pushed the offshore yuan 0.5% lower, tumbling just shy of 6.94 against the dollar, and approaching cycle lows hit in August when Beijing unleashed its latest crackdown on speculators. 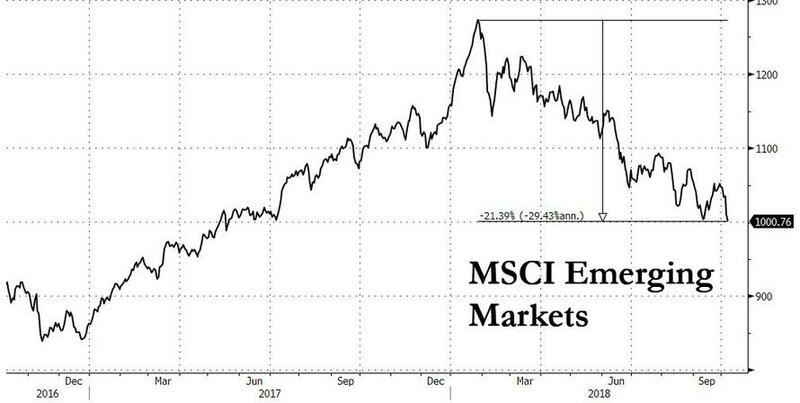 The dark mood in China sent shivers across Asian markets - the MSCI benchmark emerging markets index dropped 0.7% to its lowest level since May 2017, and is now down 22% from January’s peaks. "The return of Chinese financial markets after the Golden Week holiday is setting the tone for the rest of the world in a week that begins with the U.S., Canada and Japan all out on holiday,” ING Group's Viraj Patel wrote in an email to clients. To a large degree, both Chinese equity markets and the yuan “are playing catch-up to last week’s turmoil in global markets" and the results are ugly. Delayed or not, Asian concerns quickly spilled over to European markets where the pan-European index dropped 0.7 percent and Germany’s DAX 0.8 percent lower as investor confidence took a knock from the "powerful cocktail" of last week’s spike in Treasury yields, the Chinese market slump brought on by concerns that an escalating trade war with the United States, and fears about Italy’s defiance of EU officials added to an already gloomy mood across equities, sent Italian yields soaring and the euro to 2 month lows, while further weakness in German industrial data added to pressure on the euro. Oil and bank shares led the Stoxx Europe 600 Index lower after equities earlier sank from Sydney to Shanghai, where traders returned from a week-long break. U.S. stocks Japan was also shut. And with US futures also retreating and appearing poised to extend losses following the worst week in a month for American equities amid a rout in Treasuries, which won’t trade on Monday because of a holiday, it quickly became a sea of red, as the MSCI world equity index, which tracks shares in 47 countries, falling 0.34%. The fall in global equities boosted demand for the dollar as investors rushed for safety. Against a basket of its rivals the greenback rose 0.3%, edging toward a 14-month high hit in mid-August, and speculation that DXY 100 may soon be broken. Meanwhile, as reported earlier, Italy’s 10-year bond yield rose to a four-year high and banking stocks sold off as the populist-led government refused to bow to EU criticism over its planned budget. Germany’s 10-year government bond, the benchmark for the region, remains close to four-month highs at 0.559%. In FX, the dollar advanced versus most of its Group-of-10 peers as Treasury 10-year futures slipped in Asia, before rebounding in Europe, with cash trading shut due to a U.S. holiday; the euro slipped below the 1.15 handle against the greenback and Italian 10-year bond yields rose to the highest level since 2014 as Italy’s government sticks to its position on next year’s controversial budget. The pound fell, with time running out to get a Brexit deal in what looks set to be a milestone week for both the talks and the U.K. currency. Canada’s loonie was weighed down by the continued drop in oil prices, while the yen reversed an earlier drop as the risk-off tone extended into European trading. The New Zealand dollar reversed earlier losses, supported by option-related bids. Looking ahead, traders are focusing on the world’s biggest economies for signals to the direction of markets for the rest of this week, with US Q3 earnings season on deck, while U.S., investors are gearing up for $230 billion of Treasury auctions following a selloff last week that took 10-year yields to the highest level since 2011. In EMs, South Africa’s rand slipped on reports the finance minister sought to resign, while Brazilian assets trading in Europe advanced after investor favorite Jair Bolsonaro led the first round of the presidential election with more votes than polls forecast. In this weekend's Brazilian election, far-right candidate Bolsonaro won the first round of elections but failed to get an outright victory, as he managed to bag 46.1% of valid votes (short of the 50% needed for an outright victory) while left-wing Workers’ Party candidate Haddad came second with 29.2%. The runoff election is to take place on 28th October 2018 where opinion polls conducted before the election predicted that the candidates would be tied, according to the BBC. In overnight geopolitical news, US Secretary of State Pompeo said US and North Korea are close to an agreement on logistics for a second summit and added that the North Korean leader said he is ready to allow international inspectors to a nuclear site and a missile engine test site. There were also reports that North Korean leader Kim Jung Un is to visit Russia soon. Furthermore, Chinese President Xi is to visit North Korea. Elsewhere, oil dropped back to $83.27 per barrel after Washington said it may grant waivers to sanctions against Iran’s oil exports next month, and as Saudi Arabia was said to be replacing any potential shortfall from Iran. Asian stocks traded on the backfoot as the region mimicked the lead from Wall St. where the S&P 500 posted its worst week in nearly a month as the tech sector underperformed, while Nasdaq Comp. pulled back over a percent as tech giants lagged and the Dow notched its second straight weekly declines as the index was pressured by heavyweights Intel and Caterpillar. ASX 200 (-1.3%) was weighed on by material and financial names following ANZ’s profit warning which dragged the likes of CBA, WBC and NAB lower in sympathy, while KOSPI (-0.6%) initially outperformed amid positive developments in the Korean peninsula before dipping in the red and Nikkei 225 is closed due to a public holiday in Japan. Elsewhere, Shanghai Comp. (-3.7%) plummeted as mainland China played catch-up, with participants re-entering the market and reacting to last week’s trade developments, rising yields, China downgrades and weak Caixin manufacturing data. Hang Seng (-1.3%) eroded initial gains as sentiment turned sour along with the mainland. 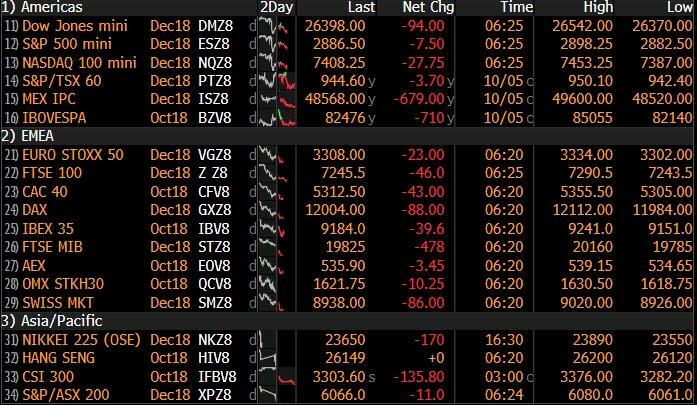 Key European indices are down, with DAX Dec-18 futures testing 12,000 to the downside and the FTSE MIB significantly lagging its peers, down over 1.5%. This follows an EU commission letter stating that Italy’s budget targets are a source of serious concern in particular impacting Italian banks. Weakness in Italian banking stocks has pressured the financial sector, with this segment down by almost 1% Major sectors are all down, with energy down by over 1% following comments that the White House may alleviate some Iranian sanctions, and IT names lagging their peers in continuation of price action seen in the US on Friday In terms of individual equities Norsk Hydro are leading equities being up 4.6% following reports that aluminium refining is to restart at half capacity. Additionally, Schroders are up over 1% following speculation around a GBP 13bln joint venture with Lloyds. Deutsche Bank is down over 1.5% amidst reports that MIFID II is affecting revenues. In FX, The DXY index and broad Usd have rebounded further from last Friday’s post-NFP lows, albeit not uniformly as the safer-havens are bucking the trend, but enough to nudge the DXY back up towards 96.000. Market holidays in Japan and the US ahead (latter only partial) may have exacerbated price action/moves, but it’s certainly been a risk-off return from Golden Week in China and the Italian budget issue continues weigh on investor sentiment. Back to the Dollar, or rather the index, and beyond the big figure last week’s peak was 96.124. CAD - The biggest G10 loser as oil prices retreat to compound the overall downturn in risk sentiment, and the Loonie retreats to 1.3000 vs its US counterpart, eyeing a couple of tech levels just above (1.3013 and 1.3018) having failed to derive any lasting support from Canadian jobs data. EUR/GBP - The next major outperformers, and both losing grip of round numbers/psychological handles in relatively quick order amidst stops and the aforementioned bearish factors. The single currency is under 1.1500 and Cable sub-1.3100, but the former is holding above decent option expiry interest at 1.1450 (1.5 bn) and the latter has regained some poise having tested 1.3050 stops, with Brexit impulses still supportive on balance. JPY - A clean break of stops at 113.50, and chart supports at 113.56/113.42 (Tenkan and Fib respectively) has propelled the Jpy up to almost 113.25 vs the Greenback as the more attractive currency of the pairing during periods of pronounced risk aversion. EM - A bit of a mixed bag in terms of performance across the region, with the Rand hit hard after rumours/reports that SA Finance Minister may quit, but the Lira holding up better vs a strong Dollar ahead of the Government’s inflation combating measures due to be announced on Tuesday. 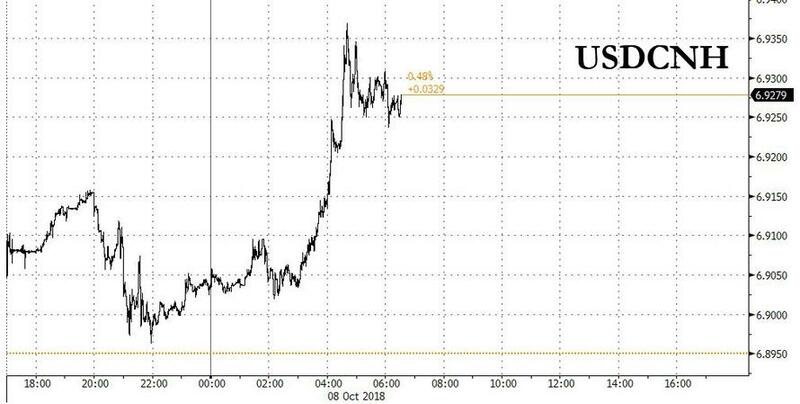 Similarly, the Peso is benefiting from pre-positioning before the Real re-opens after Sunday’s Brazilian election and a bigger than anticipated 1st round victory by Bolsonaro. However, the Rouble has been undermined by a retreat in Brent and unable to reap the reward of speculation that US sanctions may be less harsh after mid-term elections. Usd/Zar around 14.8500, Usd/Try near 6.1600, Usd/Mxn close to 18.8300 and Usd/Rub hovering just under 67.0000. In commodities, the crude complex is in negative territory with Brent breaking the USD 83.00/BBL level to the downside amid suggestions from the US Government that exemptions may be granted to countries who have made efforts to cut Iranian oil imports. This also comes amid the possibility of a Saudi-Kuwaiti oil field restart and further confirmation by Saudi Energy Minister Al Falih that 1.3mln BPD of spare capacity can be used “if needed”. This has increased the possibility of rising supply to the oil market, and pushed both Brent and WTI down by over 1%. In metals markets, gold has broken through the USD 1200/OZ level to the downside as the yellow metal is being hit by a stronger dollar. Aluminium prices are also in the red, with prices falling by over 4%, after a Brazilian court ruled that Norsk hydro’s aluminium plant may be reopened, albeit at a lower production level. Zinc and copper have also slipped due to the effects from a stronger USD. Will this week’s US CPI (Thursday) be the line in the sand for the current rates sell-off or will it add fuel to the fire? There’s nothing in the forecasts that suggests anything untoward this month but to be fair there seldom is as the consensus is for a +0.2% mom core reading - the same forecast now for the 36th month in a row. So all eyes on this as the week progresses. We’ll highlight the rest of the week ahead at the end as usual (note it’s a US holiday today - bond market closed) but for now it’s all about rates. As regular readers know, here at DB we’ve been one of the most bearish on the street on rates for some time and often it’s been frustrating. As we ourselves discussed in our 2016 Long-term study and our “ Why rates and yields are rising, and why they should continue to... ” this year, we think the bear market started in the second half of 2016 due to: 1) ‘peak labour’ after a 35yr surge in the work force and the maximum depression of wages ended in the middle of this decade, 2) Brexit being misinterpreted as a reason for a further rates rally whereas it actually kick-started populism winning national votes and a subtle move to more fiscal spending/less austerity, 3) in a similar vein, the vote for Mr Trump was always more likely to increase fiscal spending in the US, 4) peak globalisation, 5) the BoJ moving from QQE to YCC in this period, and 6) the ECB announcing in December 2016 that they would soon taper after warming the market up to this in the months beforehand. The lows in 10yr Treasuries and Bunds were 1.35% and -0.19% in July 2016. So at 3.23% and 0.57% currently, this bear market has been in place for a couple of years now but without a major breakout, especially in Europe. Indeed, this year has been frustrating for bond bears as every time yields have threatened to break out something has emerged to cap the rise and send yields back down. So is this sell-off the real deal? Well, our views haven’t changed much but it’s fair to say that we probably need more hints of inflation to keep momentum in the move. Perhaps last week’s Amazon wage hike was a catalyst in shaking markets out of their complacency that wage inflation in this cycle is going to remain perennially subdued. We continue to think the risks to yields and inflation are asymmetric to the upside. The biggest risk to this view is that yield rises start to trigger a financial market crisis somewhere around the world. With global debt to GDP still at record highs, this is a genuine risk. Overall, the house view continues to be 3.50% and 0.90% for 10yr Treasuries and Bunds by year-end. Just as the rest of the world is tightening policy, China loosened policy again over the weekend. The PBoC have announced a lowering of the RRR (the fourth time this year) for some lenders as of October 15th. The statement released alongside confirmed that the PBoC will continue with prudent and neutral monetary policy. Having been closed for all of last week mainland Chinese equity markets resumed trading overnight with heavy losses, which have intensified as the session progressed. 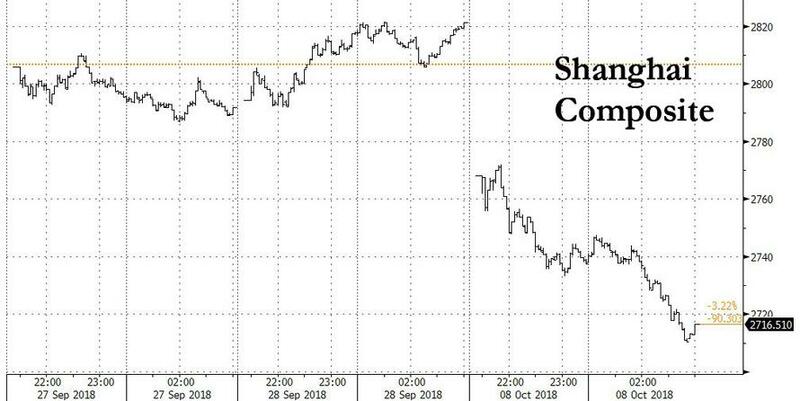 As we go to print, the Shanghai Comp and CSI 300 are -2.95% and -3.60% with the tech sector of the Shanghai Comp down -3.59%. For some context, the Hang Seng declined -4.38% last week; so these moves aren’t completely out of line given moves last week. The CNY has also depreciated 0.43% and is back to the weakest since mid-August at 6.898. Our economists in China continue to expect 7.4 by the end of 2019. Meanwhile, other markets in Asia are also down including the Hang Seng (-0.87%) and Kospi (-0.40%). It’s worth adding that the moves in China this morning may have been worse had it not been for a stronger-than-expected Caixin services PMI (53.1 vs. 51.4) reading for September. Elsewhere, Brazil’s first round presidential election took place over the weekend with far-right candidate Jair Bolsonaro emerging as the victor by some margin. Mr Bolsonaro won with 46.2% of the votes while his closest challenger, Fernando Haddad, got 29.1%. The margin of victory is even bigger than what polls had suggested with the second round vote due on October 28th with those two candidates facing off. Brazilian assets gained as support climbed for Mr Bolsonaro in recent weeks so it should be a decent open for them later today. Reviewing last week and Friday now, 10-year Treasury yields rose 17.0bps (+4.5bps Friday) to their highest levels since April 2011. Two-year and 30-year yields (+6.6bps and +19.9bps on the week) reached their highest levels since 2008 and 2014, respectively. The 2s10s curve steepened 10.5bps to 34.4bps, its steepest level since June and the biggest move since February. The MOVE index also rose (off near all-time lows) by the most since February, albeit to a low-by-historical-standards level of 55.2. Other developed market bonds sold off in tandem, with 10-year Bunds (+4bps on Friday) and JGBs rising 10.3bps and 2.5bps on the week, to fresh multi-month highs. Risk assets retreated on the back of higher yields, with emerging markets hit especially hard. The S&P 500 closed -0.96% lower on the week (-0.55% on Friday) and the DOW shed -0.04% (-0.68% Friday). The VIX rose 2.70pts but closed below 15pts, so still remains relatively low by historical standards. Tech stocks underperformed sharply, with the NASDAQ and NYFANG indexes down -3.21% and -4.18% (-1.16% and -2.06% Friday), respectively, as investors worried about the sector’s outlook. Bloomberg reported on an alleged major security breach affecting a major producer of tech hardware, which weighed on Chinese tech stocks in particular and fed through to the US. Chinese markets were closed all week for a holiday, but a US-traded ETF tracking major Chinese tech companies like Baidu, Alibaba, and Tencent, traded down -7.87% (-2.01% on Friday). The NASDAQ is now down -3.96% from its peak, outperforming the FANG index (-12.5% from peak), the Chinese tech sector (-33.96% from peak), and the broader EM complex (down -29.68% from peak and -4.85% last week). On Friday, the September jobs report was much stronger in the detail than at first glance. The headline number missed at 134,000 versus consensus at 185,000, but the prior two months were revised up a net 87,000, so the three-month average remains strong at 190,000. Unemployment fell to 3.7%, its lowest level since 1969 on an unrounded basis. The report was depressed by transitory factors, especially storm-driven declines in activity, e.g., 299,000 people reported not working due to weather, and the number of workers in the sensitive retail and leisure and hospitality sectors both declined as well. The NY and Atlanta Fed Q3 GDPnowcasts diverged another 0.7pp on the week, with the former at 2.3% and the latter at 4.1%. DB continue to estimate Q3 growth at 3.3% qoq saar. Over to Italy, which had a mixed week as more budget details trickled out. The FTSEMIB sold off slightly, falling -1.77% on the week, but outperformed versus other regional bourses (DAX and CAC fell -2.60% and -2.44%). Although the spread to Bunds is off the recent highs due to some reining in of the initial most aggressive 3yr budget forecasts, overall 10yr BTP yields closed Friday only 3bps off their post budget 4-and-a-half-year highs. The global bond sell-off is not helping Italy at its time of high uncertainty. As more details emerged through the week, the budget included official forecasts that envisioned a boost to growth that ends up shrinking the debt ratio through 2021. Our economists believe these forecasts are overly optimistic and expect the European Commission to most likely reject the budget.